Egyptian monuments from 3,000 B.C are believed to represent the Mastiff breed. In 55 B.C, Caesar brought some Mastiffs back to Rome from Britain and used them for bull, lion and gladiator fighting. Later, the dogs were used to protect English peasants from wolves and other predators. 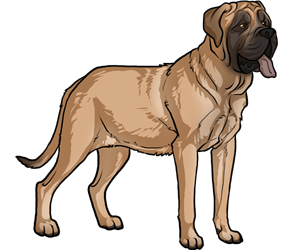 The Mastiff is documented in Chaucer, who describes them as "large as steer."